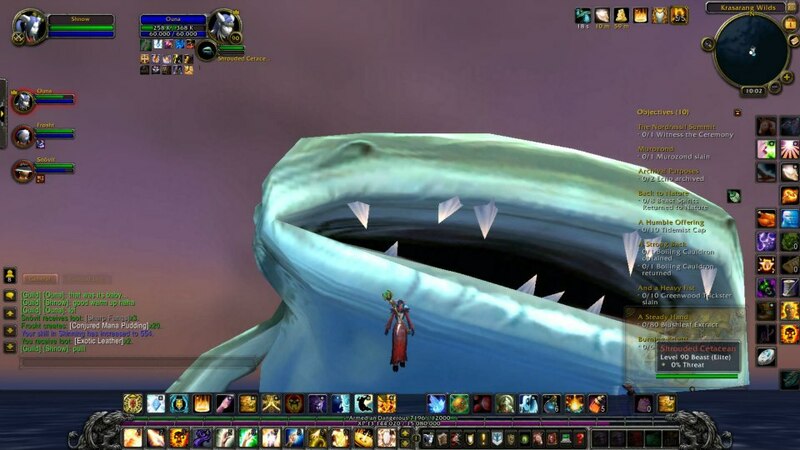 Frequently in WoW, there are gigantic World Bosses that roam around. These bosses sometimes gives really sweet loot, an achievement, or mad bragging rights. Myself, my sister, and another good friend of mine decided to take down two of the biggest sharks in the game. It started out like another wow day. 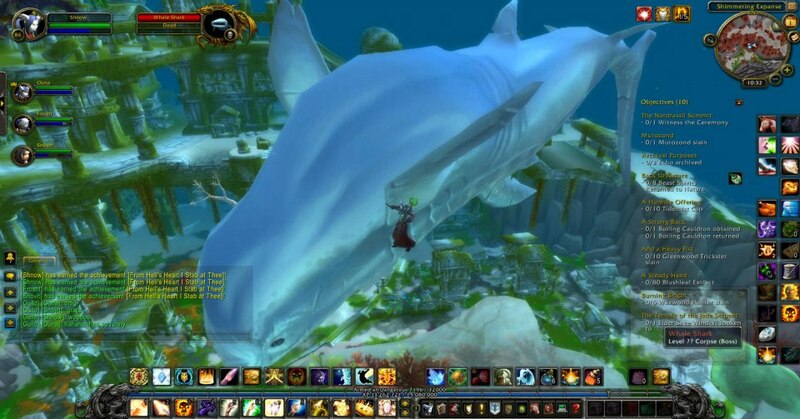 Running around in Pandaria, minding your own business, and then bam: what the hell is that gigantic mob over there? It’s a Shrouded Cetacean! The first thing any normal wow player would do is size up the mob. Can I take it down? My answer was “probably not.” I wasn’t even level 90 yet at the time. However, the only logical thing to do was to try anyway. I gathered some interest from my guild and got my sister, one of my close friends, and another awesome guildie to help out. I didn’t die again, but the tank and some dps still died a few times before we eventually got him down (I was healing, and successfully pussied out and ran away when things got bad.) Unfortunately, there was no achieve and no loot for this guy! It was really pretty upsetting; quite the let down indeed. Ouna struck a pose atop the corpse. The lack of reward failed to quench our thirst for sharks. It was decided that we were going to also defeat the Whale Shark, which was known to give an achievement. 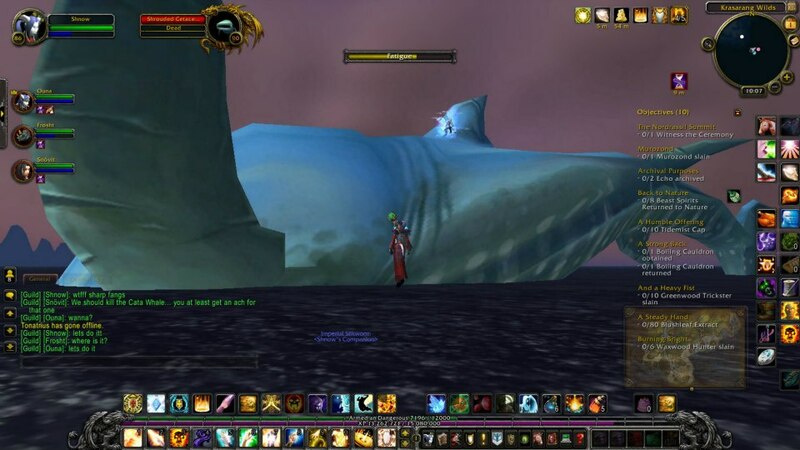 The Whale Shark was known to be difficult, but he was from the previous expansion. We are overleveled now; how hard could it be? The only option was to “mega kite” him, as we called it. ”Kiting” means to have the tank run around, so the boss chases him. This is useful if the boss is slow (to avoid damage), or necessary if the boss drops goop that you don’t want your dps standing in. So, we called this a “mega kite” because it wasn’t just the tank running around: each of us took turns being the sharkbait (hurr hurr). Because this battle was underwater, it was hard to have the tank solo kite due to slow swim speeds. This resulted in many squeals and shrieks of absolute fear and terror into the mic when whaleshark got too close to the kiter. But, after much strife, the beast was down! We overcame our fear of giant sea creatures that day.